Rye is the traditional bread wheat for people from Germany east to Russia. Known as the rye belt, this is where most of the world’s rye is grown and consumed. At Weatherbury Farm, we grow Danko Rye, which is a true milling-type rye with an interesting balance between spicy and bready. Rye has numerous health benefits: losing weight, boosting metabolism, controlling glucose levels and as a heart-healthy fiber, lowering cholesterol. In 2018, Rye was grown in Independence Township on 8.26 acres on the farm known as “Pleasant View Farm.” This farm was established in 1824 by J.M Welsh. Welsh is listed in the Caldwell Atlas as a farmer, grain, stock and wool grower. Most recently, since 2006, organic grains and hay were grown on this farm. Weatherbury Farm has farmed this land since 2017. The farm has been certified organic since 2006. The rye was planted on 2017. Clover was frost seeded into the grain on 2018. 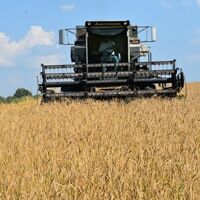 The rye was harvested on July 11, 2018. At the 2018 Washington County Fair, the Rye sheaf won 1st place and the jar of Rye grains won 2nd place. 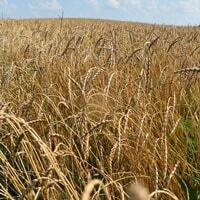 More information on rye and other grains grown at Weatherbury Farm are on the grains we grow page. To read more about rye flour, please visit our products page. Rye flour can be ordered on our order page. 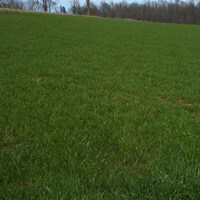 Rye Field : Look closely and you can see the frost-seeded clover in the undergrowth.